This image is circulating on social media with incorrect captions. Please find more details at the verification section of this article. The picture of Prime Minister Narendra Modi bowing down in front of a lady is of year 2014. That time many stories were spread regarding this photo. 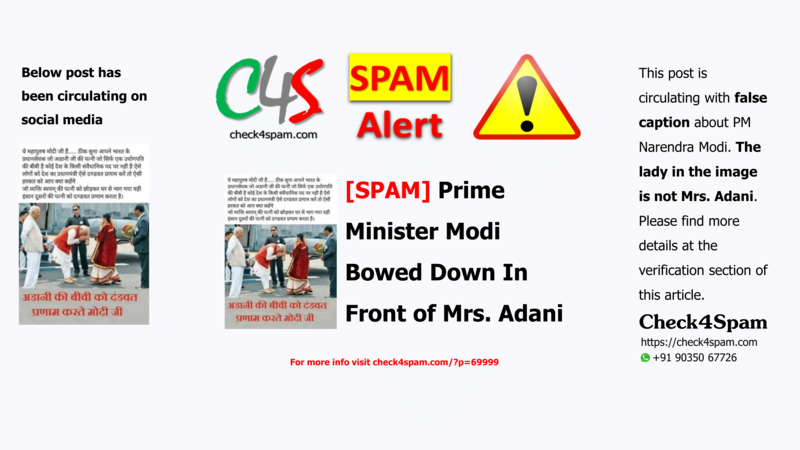 It was said that PM Modi was bowing down in front of businessman Gautam Adani’s wife in the picture. The image is circulating again with wrong captions about PM Modi. PM Narendra Modi in the image is greeting Ms Geetha Rudresh, Mayor of Tumkur City Corporation, Karnataka (Sept 24, 2014). There is nothing wrong with the image but the assumptions are wrong. That is the way people greet other people. There is nothing wrong about it. It doesn’t take a second to spoil anyone’s reputation by spreading such fake news. We are spreading rumors about our own PM by spreading it further. Please stop circulating , instead send back this verification to the person who sends this image with false caption. Check the clarification in images below. Thank You for visiting Check4Spam. Please write a comment at this article if you like our service.